Amber is known to have healing & calming effects. 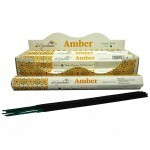 This specially formulated Amber incense .. 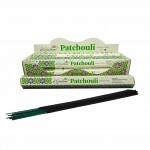 Direction for use: Fit stick into an incense ash catcher. 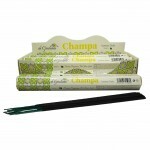 Light tip of the coated end of incens..
Champa is a combination of plumeria and sandalwood. 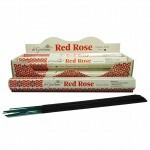 Its fragrance helps relax nerves & red.. The Seductive aroma of jasmine is known to have a pleasing & uplifting effect on the mind and he.. 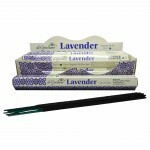 Lavender is most commonly used in aromatherapy. 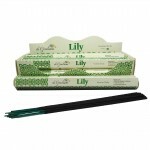 The fragrance of the plants is believed to hel..
Lily incense gives the familiar scent of the wild lilies in the garden. It has a floral, sweet.. The ancient Egyptians used the natural Musk derived from the musk deer. Now, Animal ..
Patchouli has an earthy, woody and slightly herbaceous scent which is often used to ground anxiousne..
Red Rose has the power to unite physical & spiritual love. 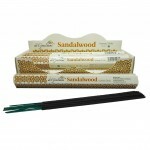 This specially formulated Red R..
Sandalwood is one of the most valuable trees in the world. It has been a part of the religious..